In the spring of 1113 (probably in the time between the 21st March and the 21st of April) a group formed of 30 young peers sets off to Cîteaux. They are led by Bernard of Fontaines (1091 – 1153), the group is also joined by four of his brothers and his uncle. The man, aged 22, and the group following him seem to have chosen the new monastery of Cîteaux deliberately. They had been preparing for the collective life in the monastery for half a year. Seemingly the special strictness in the novum monasterum is what attracted them most. Their joining set free a wave of enthusiasm for the new monastic ideal. This wave has only just made the unprecedented diffusion of the Order of Cistercians possible. Just a few weeks after joining the order the novices took their vows. 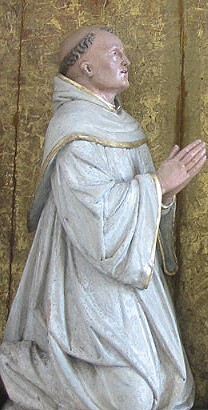 Only two years later the abbot Stephen Harding delegated Bernard and twelve fellow brothers to Clairvaux. The third foundation of Cîteaux was imparted by the nobleman's relatives, and is a donation from the earl of Champagne. Four of Bernard's brothers, as well as his uncle and two of his cousins, accompanied him on his way. “ With that the founding convent was nearly entirely in the hands of Bernard's family.“ (Eberl, Immo, Die Zisterzienser. aaO. p. 41). The light valley (lat. clara vallis) quickly develops to a model for the whole Cistercian Order. Bernard is often mistaken for the founder of the order – no other person has influenced the development of the order like he did. 72 new foundations can be traced back on Bernard personally (Braunfels, aao.S 113, 68 nach Pfister, aaO. p. 19). He intervened consistently in the oders' fates, although he was subordinated to the abbot of Cîteaux. The young abbot's charismatic spirit helps him to become one of the most influential personalities of the 12th century. Kings and Popes listen to his advice and Bernard adroitly exerts influence on the developments of his time. In 1130 he communicates in the pope-schism in favour of Innocent II, and in 1145 one of his students is nominated pope (Eugene III. - Bernardo Paganelli, himself an abbot of a Cistercian monastery). He pushes Bernard to function as a preacher in order to promote the second crusade (1146 ff.) , which he successfully does in France, Germany and Flanders. His ascetic spirit, his theological brilliancy and his deep mystical piety lasted way beyond his time. The spiritual life and the forming of the Order of Cistercians are decisively influenced by him. Bernard gives the formative figure to the ascetic features of Cîteaux. This figure expresses itself in the building codes of the order, as well as in the habits of life in the monasteries. His fantastic talent in speaking and writing brought him the honorary title of “Doctor Mellifluus“ (honey-floating teacher, see Leroux-Dhuys aaO. p.34). Under his influence the adoration of the Virgin Mary gained its pronounced importance in the order. The thought of courtly love in the 12th century was reinterpreted in a spiritual way by Bernard. Under his influence all the new Cistercian monasteries were founded in honour of Mary and all the churches are devoted to “our dear woman“. A statue of the Virgin Mary was the only figurative work of art which was allowed in the ascetic surrounding of the monasteries. Furthermore the friars completed each day with the 'Salve Regina', which was sung as the last song of the compline in every monastery. In 1153 Bernard of Clarivaux dies, filled with bitterness for the failure of the second crusade, for which he had committed himself so much. He had become the target of all criticism and felt responsible for the fiasco of the discomfiture. He was canonised in the abbey church of Clairvaux in 1174. Also he was buried in this church, which had been expanded with a round ambulatory in his honour. “If you hurry to become internalised people, then let your bodies outside. Only souls are to enter in here. Flesh does not serve anyone.“ St. Bernhard, during the admittance of novices in Clairvaux.